Orange peels (Citrus sinensisL) contain fiber and antioxidant which are beneficial to our health. Presentstudy aimed to investigate the effects of different doses of orange peels on blood glucose, lipid profile and some physiological parameters as liver and kidney functions in diabetic and hypercholesterolemic rats. Rats were divided into 3 main groups, first main group negative control, second main group diabetic rats and third main group hypercholesterolemia. 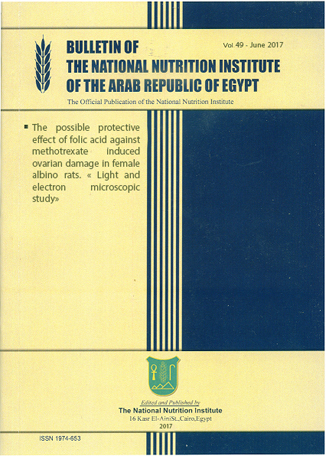 Second and third main groups were divided into four sub- groups (six rats / group) and fed with different diet levels of orange peels (5%, 7.5%, and 10%) for 28 days. Bodyweight gain, feed intake, feed efficiency ratio and relative weight of some organs were calculated at the end of experiment. Fasting blood sample were taken for determination of serum glucose, total cholesterol, triglycerides, creatinine, urea, aspartate aminotransferase (AST) and alanine aminotransferase (ALT). There was a significant reduction in both serum total cholesteroland Triglycerides in all treated groups with orange peels. The higher peels doses improved liver and kidney functions. However, the highest reduction was achieved by feeding diabetic rats with 10% orange peels. Study concluded orange peels ameliorated blood glucose, lipid profile and liver, kidney function.